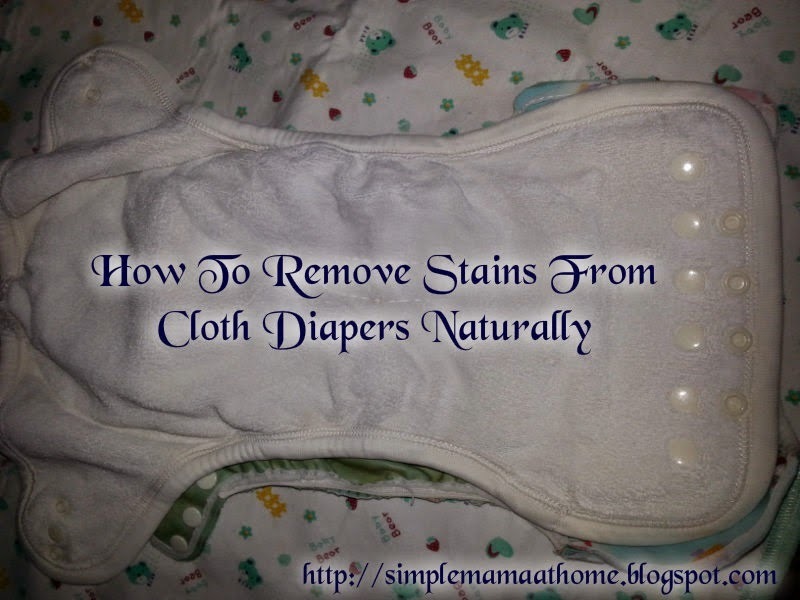 Cloth diapers can become easily stained during use. After all the purpose of a cloth diaper is to catch the urine and poop which of course result in staining. There are many products on the market that will help rid these stains. There are also some natural methods to help get rid of these stains. Will they always work? If I said yes I would be lying. So I will be totally honest. Below is what I have tried and the outcomes . 1. Invest in a sprayer. Install it next to the toilet. I have found that the sprayers have strong water pressure that can eliminate most of the waste from a cloth diaper as long as they are sprayed right away. 2. Wash and rinse well. Try to wash at least every three days at the most. I have went past three days before and it is a big mistake. Not only do stains become harder to remove but there is also the risk of bacteria and odor buildup. When washing be sure to use enough detergent however don't overdo it as this could cause a buildup of residue on the diapers. Using enough water is a must as diapers need to be rinsed really well in order to efficiently absorb wetness and waste. 3. Use lemon. Simply squeeze a fresh lemon and pour the juice directly over any stains. Then hang the diaper out with the stained areas facing the sun. This is a very efficient method. An added bonus to the removal of stains is that the diapers will also smell freshened. 4. Add baking soda to the wash cycle. When needed I add half a cup as I found this amount to be sufficient. Baking soda will also help to eliminate any odors. 5. Use vinegar in the final rinse. I have been using vinegar in the final rinse cycle since I have started cloth diapering. For me I use it as an alternative to fabric softener to get the softness. Fabric softener is not recommended for cloth diapers as they can leave a waxy residue on diapers which will cause the water to repel and decrease absorbency. I found that the vinegar is also very helpful in getting rid of stains. 6. Hang them to dry out in the sun. For best results make sure that stained areas are directly facing the sun. For really stained diapers soak under water after finished washing. Then place in the sun dripping wet. This really does work however it may take a few washes. If you are a cloth diapering parent what techniques do you use to treat diaper stains? Is it a natural method? Does it work well? I could have used this information a few years ago. I'll be sure to share this with my fellow cloth diapering mommies. I wish I knew about cloth diapers when I had my daughter years ago. I think this pregnancy around we are gunna try cloth diapers! Thanks for the tips ... I use baking soda for everything but I never thought of using lemon too. awesome tips. i'm sharing this with my friends who cloth diaper. This may work for other items too! This is awesome information that I am sure anyone that uses cloth diapers would appreciate. I will share this info with my friends that use cloth diapers. Cloth diapers and other stains too! Thanks!